Political Spin Removal: Is the White House Serious About Mideast Peace? 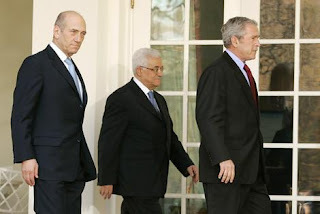 The Bush administration seems quite proud of the recent peace talks in Annapolis MD, between Israel’s Prime Minister Olmert and Palestinian Prime Minister Abbas, with Syrian and Saudi delegates also in attendance. While this meeting was mostly a publicity stunt by a lame duck desperate for an honorable mention in the history books, I grudgingly admit that it may actually have rekindled a process that could lead to peace. Even so, I am not seeing the intellectual engagement by the White House that is necessary to make this process succeed. For example, I noticed a well-written letter to the editor in the Financial Times online (www.ft.com/home/uk, “Let's start talking about a single-state solution,” November 28 2007 02:00), that argued against a two-state solution in the middle east. Martyn Turner pointed out that “The starting point for all previous talks has been the partition of the land into two states. This immediately creates problems, Jerusalem and Palestinian refugees being the two most obvious. It would create a Palestinian state comprised of two disconnected pieces of land, which would never be a viable state, especially since the connection would be controlled by Israel.” Turner therefore recommends a one-state solution, although he does not say what that means. I think the geographic argument is valid. Like East Pakistan and West Pakistan, two disconnected terrains can probably not survive as a single political entity. We are already seeing the beginnings of a spinoff of Gaza into a state separate from the West Bank. So maybe a three-state solution will unfold from a two-state solution. That would not be so bad. Turner implies that the problems of a two state solution (such as Jerusalem and refugees) are intractable and therefore not worth considering. I suspect Mr. Turner is not in the foreign service. Surely the status quo is intolerable, making any alternative worthy of consideration. There are several ways Jerusalem could be divided or shared, none of them perfect, but none impossible. There have been divided cities before, such as Berlin. Israeli Prime Minister Olmert is correct to foresee that if refugees flooded Israel, they would soon outnumber Jews and a political rights situation would develop similar to that in apartheid South Africa, and eventually, Palestinians would control Israel. That logic seems impeccable to me, so there is no way Israel is going to open the door to Palestinian refugees, ever. But other solutions may be possible: Reparations, relocations, compensation, etc. Israel is sitting on a lot of Arab land it acquired in 1967. A tradeoff is not inconceivable. There have been parallel refugee situations in history, not the least of which involved Jews returning to Europe after WWII. I think the greatest barriers to peace are not these obvious issues. A more serious one is, do the Israelis have the political will to withdraw from the West Bank and abandon all those illegal settlements? That’s like asking Americans to agree on abortion or prayer in schools. I can’t see it happening. Can the Arab states restrain the fanatics who would continue to lob rockets into Israel? I don’t see such restraint happening either. The big problems arise from ideological zeal, not the practicality of partitioning the geography. I am therefore not optimistic about this new impetus to peace. Nevertheless, no problem is utterly hopeless. Does the Bush administration have the motivation or even the intellectual capacity to address such problems creatively? There is no evidence of it.